Search for Marlboro homes for sale and homes in Marlboro. Call 732-598-7700 to see the homes in Marlboro. Marlboro formed in 1848 using portions of Freehold. The town is named after marl , which was an early form of fertilizer. The first industry of Marlboro was the export of marl. Marlboro was the scene of a number of skirmishes during the Revolutionary War. 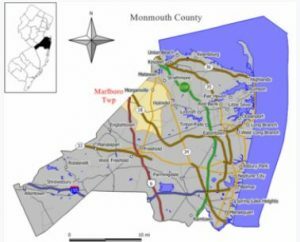 During that time, Beacon Hill, the second highest point in Monmouth County, served as one of 23 state-wide warning beacons. These beacons were used to signal local militia of a British invasion. Homes in Marlboro prices start at the starter home level however upscale detached single family homes can easily exceed $1 Million in Marlboro. Marlboro homes are mostly single family homes, however there are also four main condo complexes in town. The 2010 Census showed there were 40,191 people living in Marlboro, in addition there are over 13,000 housing units. A section of Marlboro called Morganville is in the northern part of Marlboro, and in fact, Morganville has it’s own post office and zip code. The Census also showed that the median household income was $130,400. Education for K-8 students is provided by the Marlboro Township Public School District, which has 1 pre-school, 5 elementary schools and also 2 middle schools. When students enter high school they will attend a school in the Freehold Regional High School District. There are six high schools in the Freehold Regional High School District. The schools are Marlboro, Freehold Township, Colts Neck, Freehold, Howell and also Manalapan. Students from Marlboro homes will attend the high school according to boundaries set by the district. And most, but not all, will attend the Marlboro High School. The six high schools each offer a special curriculum for talented and highly motivated students. Any student in the Freehold Regional High School District is eligible to enroll and there is a competitive admission process. SAT scores consistently exceed state and national averages in all six high schools. Not surprisingly, more than 87 percent of the district’s students pursue higher education. There are also many private schools in the area.